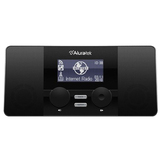 Aluratek's new Internet Radio Alarm Clock with Built in WiFi allows you to easily access more than 11,000 radio stations in over 150 countries around the world with no monthly fees. Simply turn the unit on and it will automatically connect to a wireless network. You may also connect to a local Ethernet cable network if you prefer. Search for music geographically by continent / country / state or by the more than 50 different available genres including a wealth of talk, local news and sports radio stations broadcast throughout the world. Once you find a favorite station, add it to your favorites list for future easy access. This is the perfect solution for the home, office, college dorm or anywhere you want to listen to thousands of radio stations.